Hawaii Gov. 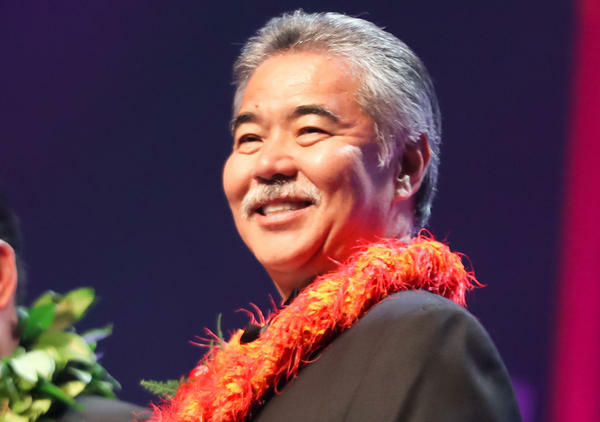 David Ige, pictured in 2016, faced a strong challenge to his re-election but won his party's nomination Saturday. Hawaii is heavily Democratic, and like other areas where one party strongly dominates, the primary essentially functions as the general election. In January, a false alert of an impending missile attack created a panic on Hawaii for 38 minutes before an official notification was sent. Hanabusa attacked Gov. Ige's handling of the incident in her campaign to unseat him. But in the months since, "Ige was seen responding to other natural disasters, including historic flooding on Kauai and Kilauea eruptions on the Big Island that destroyed more than 700 homes and displaced thousands" Hawaii News Now reports. The governor "also touted the state's work to stand up to the Trump administration, including on travel bans," it adds. Ige will face Republican Hawaii state Rep. Andria Tupola in the general election after Tupola won Saturday's Republican primary. Several Democrats ran to fill the 1st Congressional District seat Hanabusa said she was giving up to run for governor. The district includes Honolulu, Hawaii's biggest city. Results late Saturday local time showed Ed Case taking 39.1 percent of the vote in a field of seven Democrats vying for their party's nomination for the job. Ed Case previously represented Hawaii in Congress between 2002 and 2007. He told The Associated Press he ran again because the government "is not functioning at all" and he says he can help. The Honolulu Star-Advertiser says Case describes himself as a "moderate mainstream Democrat." "I think the message that I've been carrying out there about fixing our government and trying to solve problems, rather than make them worse, and trying to talk rather than yell at each other — I think voters have been looking for that," Case said Friday, the paper reports. Case has been a member of the Blue Dog group of Democrats in Congress, who are more fiscally conservative than many others in their party. He will face Republican Cam Cavasso in November's general election. Democrat Tulsi Gabbard easily won re-election as the Democratic nominee to represent the largely rural areas in Hawaii's 2nd Congressional District, where she has served since first being elected in 2012. Gabbard will face Republican Brian Evans, who ran unopposed in the Republican primary, in November's general election.